ExpanDrive costs $50 and it seems to be the best option you can go for right now – considering that you need a cloud storage manager. Over the past couple of years, we’ve seen more and more cloud storage services launched than ever before. But, not all of them are good. Sure, they alleviate many problems but sacrifices are made for having convenient access to data at all times. There are a bunch of headaches, but the most annoying ones are dragging and dropping files from a browser and installing apps on your computer. The first proves to be completely unreliable and the latter will slow even the most power-hungry computer. ExpanDrive mounts a readable and writeable drive on your Mac. It’s visible if you use the Finder, from apps and other local storage devices. Read our ExpanDrive Review below to better understand why you should use it. 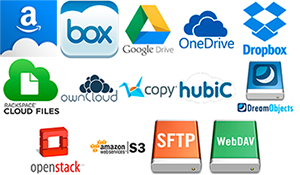 ExpanDrive 5 is compatible with an amazing list of services, such as DropBox, Microsoft’s OneDrive, Google Drive, Amazon S3, WebDAV and FTP/SFTP. With the latest ExpanDrive update, Amazon Cloud Drive bolsters its ranks. Considering that the massive e-tailer’s service consists of 60 bucks a year for unlimited storage, I say this comes just in the nick of time. The Drive Manager window controls all the services that you can connect to – also, you can choose freely what to disconnect. The list of services can be set to be automatically mounted upon startup, if you find manually connecting a chore. If you click on the magnifying glass, it will take you to the drive in the Finder. ExpanDrive does this by default each time it starts up – you can disable this from Settings. 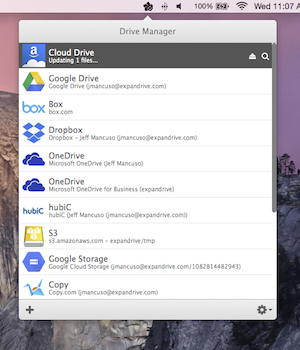 The usual Cloud Storage Drives will appear on your desktop in the universal silver drive icon. All of them are colour-coded. For example, FTP will be displayed in a blue colour, SFTP in a red or orange one. The palette can be found in Drive Manager also, but it’s slightly inconsistent. However, you can give any service nicknames so you don’t mix them up. After you mount a service, ExpanDrive works exactly like you think it will. Any file can be dragged and dropped, or easily previewed via QuickLook. You can also create, delete and rename folders exactly the same as you would on any other drive. Note that how fast these actions will be completed depends solely on your internet connection and your computer. I didn’t found any complaints on forums and some users said that it works like a charm even with a 50 Mbps connection. I’m using ExpanDrive on a 1Gbps connection and I, clearly, didn’t have any problems with it. ExpanDrive is incredibly responsive and stable due to its multi-threaded connection engine – this maintains optimal system performance even when your transferring huge chunks of data. Yet, there are exceptions. Finder will freeze for a short period of time when transferring data to a Dreamhost SFTP server. The company has promised big changes and FTP improvements with their 5.1. update – which is free, by the way. Early versions of ExpanDrive relied on MacFUSE for all of the hard word, but it proved to be unstable and riddled with issues. ExpanDrive 5 has become independent and now has 64-bit support. The company states that it can clock in at up to 10x faster experiences. Compared to previous versions, calling it a dramatic difference is an understatement. A pretty great feature, that unfortunately we don’t see that often on cloud storage managers, is the ability to automatically resume a transfer if it was interrupted. This comes as a knight in shining armour for MacBook owners that are constantly on the go. When you transfer files, a small indicator will appear in the lower right corner. The status is also displayed in the Drive Manager. One mildly annoying issue that I have encountered with the ExpanDrive is that it displayed only the first 200 files in my Amazon Cloud Drive, but that was one update ago. For $50, you get one of the fastest and most reliable cloud storage managers on the market. Developers quickly asses bugs and bring hot-fixes, updates are free and customer support is rather exceptional. Download ExpanDrive 5 right now.